1P-LSD , the chemical abbreviation for 1-propionyl-lysergic acid diethylamide is in a class of drugs called lysergamides and is possibly considered an analog of LSD and is also described as a homolog of the notorious ALD-52. 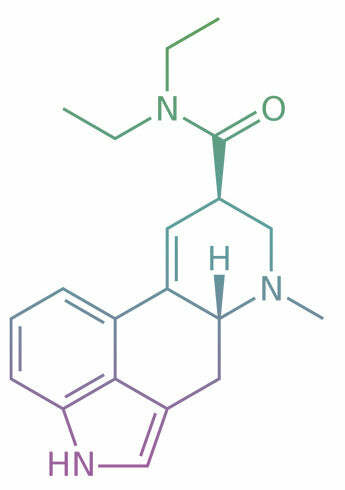 In recent animal studies, 1P-LSD showed that it is 38% the potency of LSD in mice. This means that not only is 1P-LSD a prodrug of LSD (a compound that once metabolized breaks down into another active compound) but is also active in its own right through being a serotonin receptor agonist. Research laboratories choose to buy 1P-LSD online so that they may study the research chemical's behavior and/or functions. However, if you choose to buy 1P-LSD online through a research chemical vendor (such as Causing Color) then you must be aware of the legality of such compounds within your country. This research chemical is currently illegal in Switzerland and Latvia, and all though legal~ could possibly cause some problems because it is considered a prodrug of acid (LSD). This member of the lysergamides is often compared to other psychedelic drugs such as LSD in its effects. Which has been shown to produce a greater capacity for whole brain functioning, heightened states of consciousness, mystical experiences, and an overall highly enhanced sensory experience of life. It must be noted that 1P-LSD is not for human consumption and is strictly for laboratory use. If accidently consumed it would be wise to call a poison control center immediately due to the lack of study on this chemical. This chemical is active in the mcg range and therefore should be handled with caution. Using gloves while handling and keeping it out of direct sunlight is generally the best-accepted practice. Ordering was a breeze. Have not tried product yet, but from order to delivery, everything was as advertised. Delivery was almost 2 weeks to the day from the time product was shipped. Will definitely order again! Product arrived just yesterday. Overall took about 12 business days from shipping confirmation email. Well I will admit the product is very good indeed so 5 stars on that however the price is a bit high compared to what I always paid for lsd25 which was around 5 dollars per blotter so I was sad that I only got 2 for the price of like 10-15 with standard shipping even no.tracking etc. Truthfully your better off waiting and using a standard shipping anyway as it is just more stealthy than a parcel it arrived pretty fast as well considering I'm in the southern USA so all in all product was wonderful better than I expected by far 200 ug taken around 1:45 am lasted a good 8-10hrs although the first 4 were pretty intense but the comedown is smooth but I'd recommend having a lil benzos on hand in case you feel it is too much personally it was on par with the stuff I got back in the 80s and 90s I would definitely shop here again but i do have other vendors that give about 10 blotters for around the same price as 2 here although I cannot promise that the quality is the same as I have not gotten it yet anyway hope you all find this helpful and stay safe friends. Perhaps not entirely fair to leave a 1-star review, but customers should know that even very small quantities might not arrive.